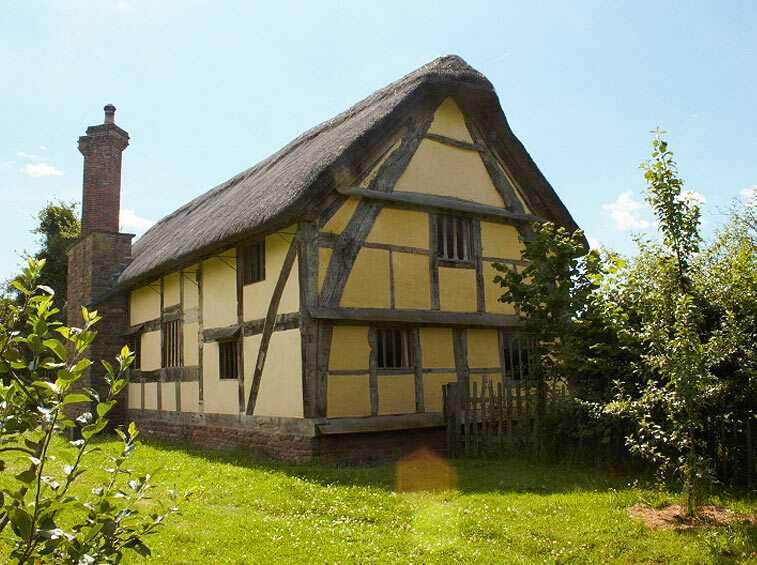 Hacton Cruck is a recently completed, RICS award winning restoration and though it has modern facilities, furnishings and technology, please take into account that in essence it is still a 600 old medieval hall. Far more of the original feel of the building has been retained than is usual outside of a museum setting. While there are numerous old buildings that have been modernised and turned into upmarket or “luxury” holiday lets, Hacton offers something more and will appeal to those of you who are looking for a deeper experience. So is it for you? 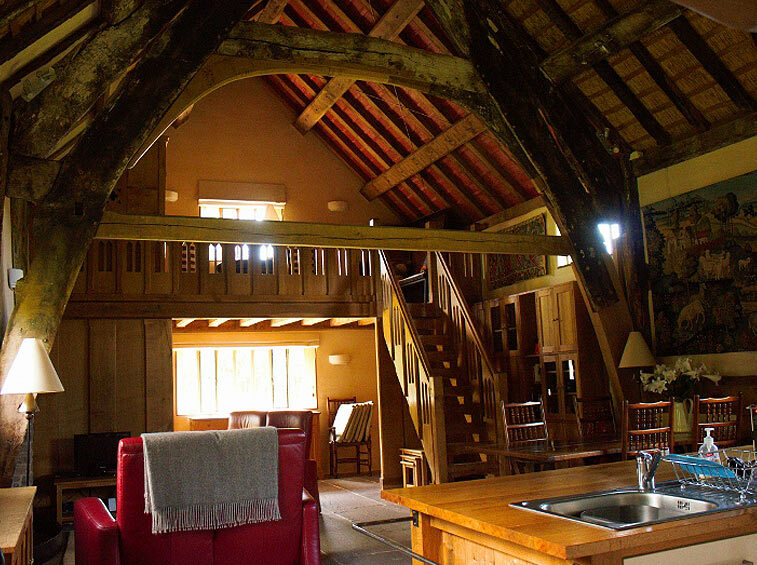 "To a standard far surpassing the usual holiday lets including dare I say the Landmark Trust"
If you are looking for character, this has it in abundance. If you are interested in building conservation, architecture, history, exploring the countryside, real darkness, peace and quiet, muddy walks, evenings spent playing games around the fireside; great, read on. The quality of furnishings is at the high end of the scale and we’ve put in the telephone, Wi–Fi and television which, while adding to your pleasure should not be the motivating factors for making a booking. Think 'Landmark Trust', 'English Heritage' or 'National Trust'; while the building is worthy of any of these we have gone beyond creating a museum piece. 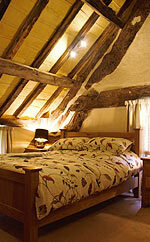 We have recreated the atmosphere of the medieval hall without it becoming stuck in a time warp. Aspects of the building are decidedly C21st; furnishings are a mix of periods, but leaning towards the contemporary. The stone flagged floor is gently warmed by under-floor heating in the colder months, with a wood burner for your enjoyment at any time of year. For winter breaks bring warm clothing, it is part of the experience. 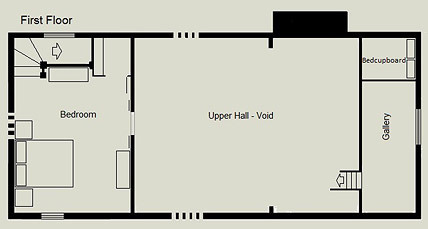 Owing to limited access to the bathroom, and a step down into the bedroom end, the house is not suitable for wheelchair access. "The bed is sooo comfortable"
While a steep solid tread stair goes to the gallery and could prove difficult for less able-bodied persons, the stairs to the main bedroom are wide and an easy pitch. There is no door at either the top or bottom of the stairs leading to the main bedroom though a turn in the stairs gives visual privacy. 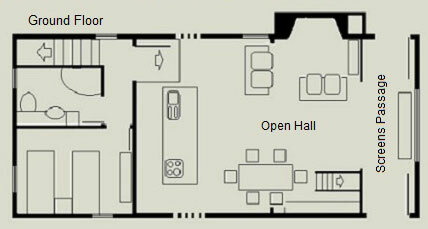 The twin bedroom is on the ground floor with the bathroom adjacent. Whether it is suitable for children is up to parents. We do not have pets in the building, and it is most definitely a no smoking venue. For those of you who can appreciate individuality and character then you can anticipate a memorable stay in a special building. Weekly, three or four day breaks. Check-in after 3pm. Check-out by 10am. Unless otherwise arranged. All bedding, towels, tea towels provided. Washing machine, dishwasher powder, liquid, cleaning materials etc. provided. Firewood in the shed, milk in the fridge, tea and coffee in the cupboard. Dilys, the housekeeper, next door; a wealth of information, expertise, common sense, humour and warmth. Further information on confirmation of booking.